Well the Robbie Keane saga has finally come to a close...at least for the next few months anyway. On the same day that Spurs gave away 4 goals and their FA Cup berth to rivals Fulham, they gave Keane away to another London club. The 30 year old has found a new home with West Ham after signing on loan until the end of the season. West Ham and Tottenham may be close to each other geographically but are very far apart in footballing terms. The Hammers are in the midst of a relegation battle that could be crucial to Keane's career. Should West Ham stay up they will have the option to sign Keane permanently for £6million ($9.5m) and he appears to be relishing the prospect, "I am ready to help West Ham stay in the Premier League, which is the most important thing for the club. I am really pleased to have signed and no I just can't wait to start training and playing football." Playing football is the most important thing for Keane as his career has run cold on the Spurs' bench. 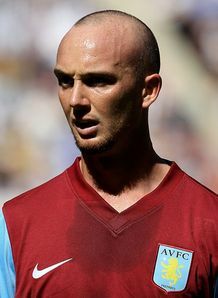 Keane will look to link up with the club's main striker Carlton Cole. Cole has scored 7 goals this season and should be a good partner for the Irishman who has previously had success with both Freddie Kanouté and Mido who are similar players to Cole. There is not a whole lot else to get excited about over this move as West Ham have been the most disappointing team in the league this year as a permanent fixture at the bottom of the table. Keane will look to benefit from the impressive duo of Scott Parker and Mark Noble who play a game that will suit his own but the overall standard of the squad is dismal. Robbie Keane is not the only Irish man who swapped clubs this weekend. The ever controversial Stephen Ireland has left Gerrard Houllier's Aston Villa and headed north to Newcastle in the hope of more playing time. Ireland had been frozen out in Villa reportedly because of his attitude and some poor performances early. His talent is undoubted and should he get his head right he should fit in with Alan Pardew's side. After gaining promotion last season, Newcastle are currently 9th in the table. They have been led by striker Andy Carroll and midfielder Kevin Nolan who have combined for 21 goals in the league. If Ireland can find a place in the starting lineup it will likely be alongside Nolan in a three man midfield. Nolan is not likely to be moved to the bench while Newcastle have some other options in the center with Cheick Tíote and Joey Barton playing well this season. Tíote and Barton are more defensive minded than both Nolan and Ireland. Ireland has landed in a nice spot that could ultimately return him to one of the most exciting players in the league. However his attitude will once again be key as this Newcastle squad has been flying high all season long and will have no reason to put up with any disruption from the Cork man. Elsewhere Northern Ireland star David Healy has joined Celtic rivals Rangers while Jamie O'Hara, who potentially qualifies to play for the Republic, has left Tottenham for Premiership side Wolves until the end of the season.